The various rover and lander missions on Mars have provided unprecedented glimpses into the planet’s past, including geological history and environmental conditions. 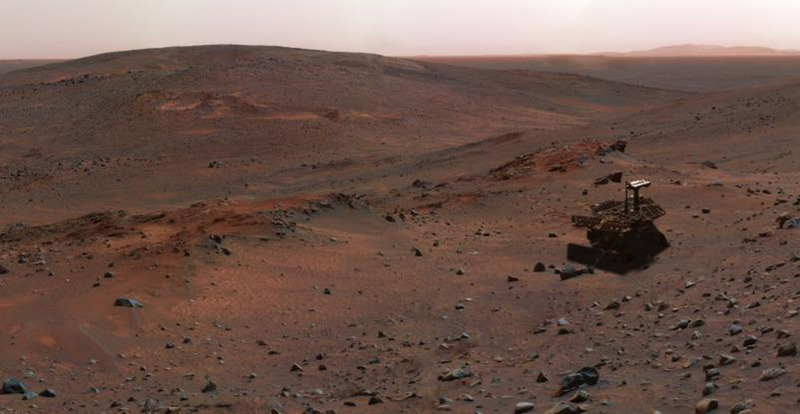 In many ways, ancient Mars was similar to Earth, with abundant water and volcanic activity. 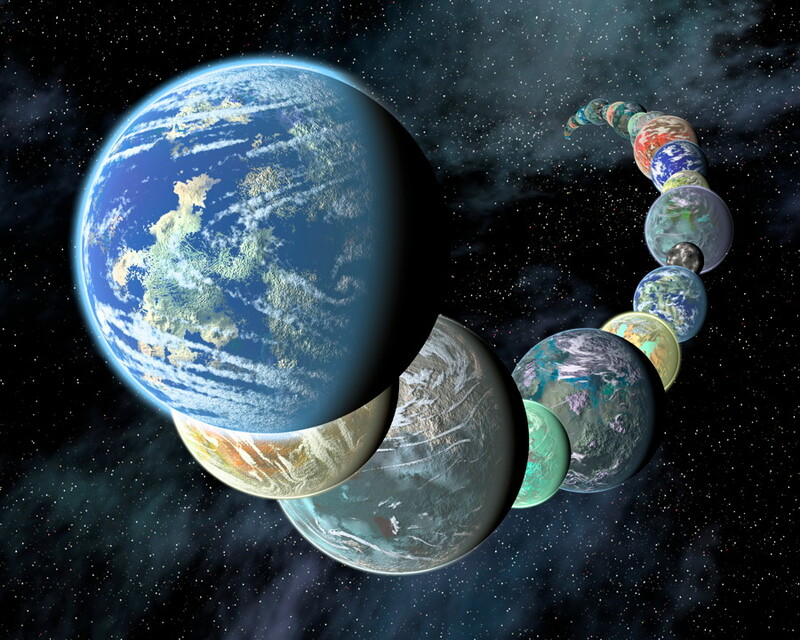 Now, new research has revealed that there was also another related Earth-like phenomenon: acid fog. 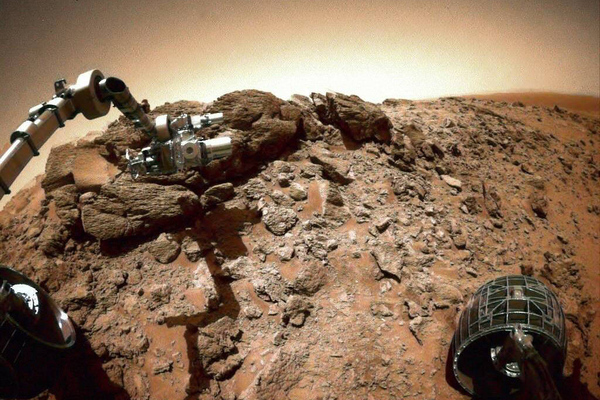 The new findings come from studies of data from the Spirit rover, which ceased operating in 2010 but sent back an enormous amount of information which will keep scientists busy for many years to come. The findings were presented yesterday, Nov. 2, in Baltimore, Md., at the annual meeting of the Geological Society of America by planetary scientist Shoshanna Cole from Ithaca College. Cole and her team found evidence within a 100-acre region on Husband Hill, in the Columbia Hills of Gusev crater where Spirit landed in 2004. They focused on some rock outcrops called Watchtower Class, which are located on Cumberland Ridge and the summit of Husband Hill. “The special thing about Watchtower Class is that it’s very widespread and we see it in different locations. As far as we can tell, it’s part of the ground there,” Cole said. When they combined the data from previous studies, they noticed some patterns emerge. Spirit studied the rocks at a dozen different locations along 200 meters. When the rover examined the chemical composition of the rocks with its Alpha Proton X-ray Spectrometer (APXS), they all appeared to be the same. But when other instruments were used, differences were noticed between the rocks. 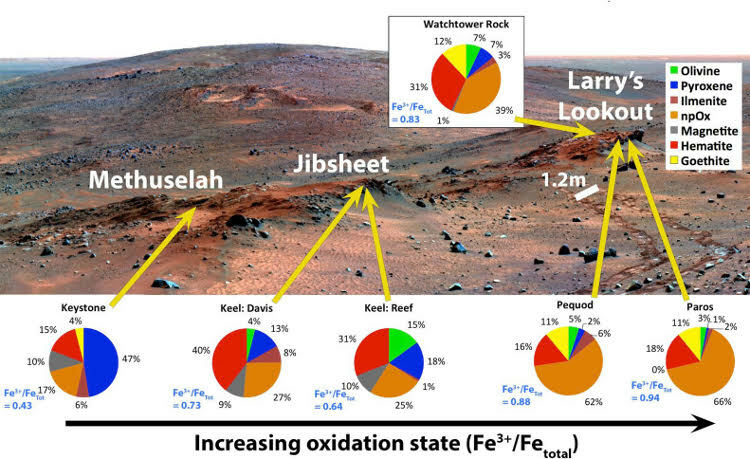 The Mössbauer Spectrometer for example showed a surprisingly wide range in the proportion of oxidized iron to total iron, which indicated that something had reacted with the iron, to varying degrees. Within only 30 metres, the iron oxidation state ranged from 0.43 to 0.94, a significant difference. Other instruments, such as the Mössbauer Spectrometer and the Miniature Thermal Emission Spectrometer (Mini-TES), indicated that minerals within the rocks had changed, losing their initial structure, becoming less crystalline and more amorphous. These changes even matched the size of small bumps on the rocks, called agglomerations, which had been observed in Pancam and Microscopic Imager images of the rocks. So what caused the changes in the rocks? The leading hypothesis from the team is that the changes were the result of acidic water vapour being released from volcanic eruptions. The same kind of process can be seen on Earth, called volcanic smog or vog, which is common in Hawaii, occurring during eruptions of the Kilauea volcano. The acidic fog erodes the rocks, dissolving some of the minerals and forming a kind of gel. After the water evaporates, it leaves behind a cementing agent which forms the agglomerations. There is also additional evidence supporting the acid fog hypothesis, dating back to a different study conducted in 2004. 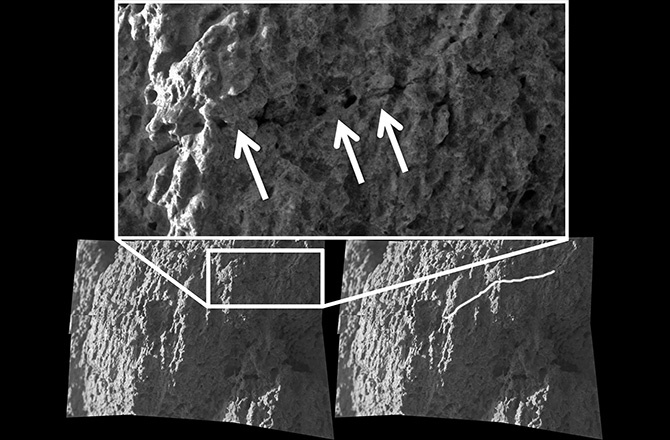 Simulated Martian basaltic rocks were used in the experiments, based on data from the earlier Mars Pathfinder mission. When those rocks were exposed to sulfuric and hydrochloric acids, they lost their crystalline structure, similar to what happened in the Watchtower Class rocks. Microclimates also play a role in how the rocks changed over time. Cole makes an analogy to a home garden, in that the alterations of various rocks depends on much sunshine and wind they individually received. The rocks which are more altered will have larger agglomerations, and are on steeper, shadier slopes with less sunlight, while the least altered rocks tend to be on sunnier and gentler slopes. Spirit landed in Gusev crater on Mars on Jan. 4, 2004, and extensively explored the area until it was last heard from on March 22, 2010, after it became embedded in deep sand and was unable to escape. Even so, it lasted more than 20 times longer than its nominal mission of 90 days, and with its twin Opportunity (which landed on Jan. 25, 2004) still going today, is a testament to how well these rovers were designed and constructed. More information about the Spirit rover mission is available here.